Elmo Anywhere integrates with Vin providers to help search and locate correct vehicles and parts for the end user. VIN Lookup is available on the New Quote screen and on the Order page. 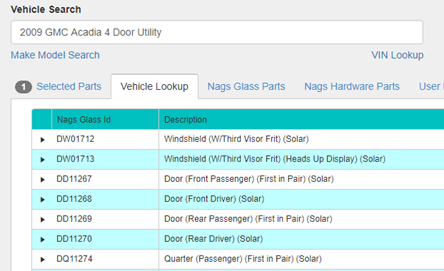 To use VIN Lookup on the New Quote screen navigate to the VIN Lookup link under the vehicle search box on the New Quote page. To use VIN Lookup on the Order page navigate to the VIN Lookup link under the VIN box located on the vehicle tab on the Order page. Click on VIN Lookup then enter the VIN in the box. After entering the VIN click the "Look Up" button to search for the correct Vehicle(s) that match the VIN. A successful match will display the vehicle(s) in a grid for the user to select the correct one. It will also display the vehicle year, make, model, body, and description in the model. Any errors or no matches will be displayed to the user. If the vehicle you are looking for is not in the current grid, you can click the Try Again button and it will do a wider search and return all vehicles back that match the squish VIN. Next, select a vehicle and click the "Return" button. 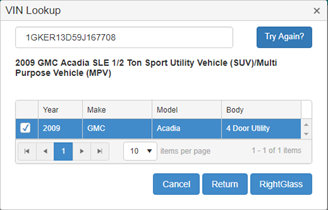 This will return you to the Quote or Order page and populate the vehicle search box and auto search the Vehicle Lookup grid with correct parts for that VIN. If you click Return with no vehicle selected or Cancel, the VIN Lookup modal will close and return to page. Note: Searching for a VIN selecting vehicle does not save the Order, you must save order to keep your progress.